God Eater 3 updated to version 1.11 in Japan. 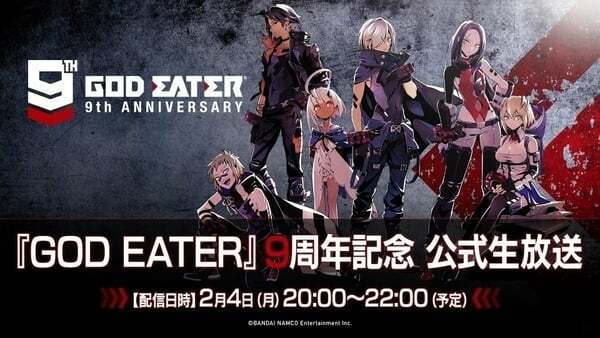 Bandai Namco will host a “God Eater 9th Anniversary Official Broadcast” on February 4 from 20:00 to 22:00 JST, the company announced. You will be able to watch it on YouTube, Niconico, and Periscope. The broadcast will feature the latest information on the God Eater series from the development team, including details on the next free update for God eater 3 and the latest on God Eater: Resonant Ops. There will also be details about the series’ ninth anniversary events and goods. Additionally, Bandai Namco announced that on January 23, it will release the version 1.11 update for the PlayStation 4 version of God Eater 3 in Japan, which adds worldwide cross-matching, player character face lighting improvements, and other battle-related behavioral adjustments and database text amendments.